Learn a basic beef stock to complete your stock-making repertoire. This article contains some good tips and recipes. Also known as a brown stock in the West, beef stock usually contain beef bones paired with a range of aromatic herbs or condiments. Common aromatics include cinnamon, ginger, peppercorns and more. The Chinese usually parboil meats used in soups but browning is also a good technique to add more flavour to beef soups and stocks. 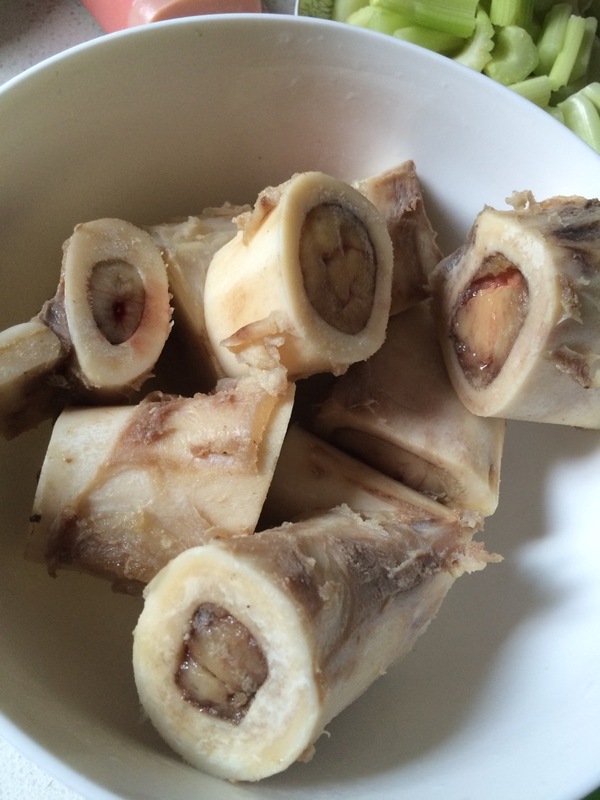 The issue with parboiling beef bones is the amount of scum created. With other meat broths, parboiling remove most of the scum so by the time you start cooking the bones, the stock will have little scum to remove. With beef broth, parboiling only remove some of the scum. The broth will still contain scum and they need to remove them because leaving them in will affect the flavour. Add a splash of white wine vinegar to the bone broth helps the calcium in the bones to leach out quicker, making the soup more nutritious. Beef broth is fatty. You can chill the soup to firm up the fats for easier removal. If you are on a ketogenic diet, then leave it in to up the fat count. Someone asked me where they can buy beef bones. The local supermarkets in Singapore seldom carry beef bones. It would be more likely found at the local wet markets. Let me know if you know of any other places that sell them. This recipe produces a light soup base. The stock may become milky because of the calcium from the bones. This recipe produces a brown stock with a strong flavor and dark colour because the beef bones and vegetables are baked first. Strictly speaking, this isn’t a Chinese recipe but if you do have an oven at home, why not give it a try? This recipe produces a clear spicy aromatic beef broth because of the star anises and peppercorns. This beef stock is best used for as a soup base for braised beef noodle soup. The baking, frying and use of preserved bean paste 豆瓣酱 (dou ban jiang) produces a very dark stock. This beef stock uses a large quantity of peppercorns, do beware! Use of aromatic spices such as peppercorns and star anise alter the flavour of the stock. It is usually a good idea to make a huge batch of soup stock at one go. Stock making takes up considerable time and the stock can be frozen for later use. Frozen stock can be stored up to 2 months. Here's how you prepare stock for storing. When the stock has cooled, measure out the amount you need for your family needs and freeze them separately in ziplock bags. Freeze them lying flat in baking trays to make it easier to thaw later. You can also use a marker to put down the dates of "production". Take one or two bags out, thaw by putting them in warm water. If you are not sure of the amount you may need each time, freeze smaller packs. It is easier to use 2 or 3 smaller packs than try to re-freeze un-used soup stock.